Paradise Camp (in Paradise Lodge), Mount Rainier National Park, WA. The lunch counter offered a la carte service and was located in the Lodge. 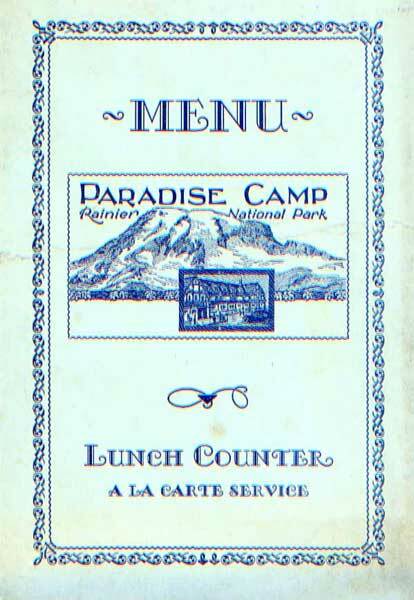 The illustrated menu has a drawing of the mountain as viewed from Paradise Camp, with an inset drawing of the Lodge. Inside shows menu items, with a note explaining how campers can buy supplies at grocery stores at Paradise Camp, Longmire and White River Camp. They claim to offer "city" prices with only a small markup. The back promotes the Camp as "a modern mountain camp where every convenience is available." Posted are room and tent rates, and housekeeping rates. COLLECTION: Digital Collection - Historical Menus Collection, Finding Aid - PH Collection No. 617 Series V. Restaurants: Pacific Northwest and British Columbia.